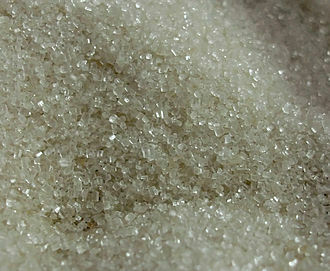 Sugar, or sucrose, is made up of 2 different parts. There’s a molecule of glucose chemically bonded with a molecule of fructose. Once ingested, an enzyme called sucrase breaks the bond and seperates glucose from fructose. Human body converts carbohydrates into glucose and uses it for energy. Apparently, fructose is poorly absorbed but ends up converted to triglycerides by the liver and contributes to blood cholesterol and obesity. Also, new research links it with Alzheimers. This is not desirable. Glucose is not that bad, but why eat it when the body makes it? Why mess with the natural process? After all, glucose spikes the insulin and too much of it can lead to diabetes. Well, sugar is addictive. Now, I am talking from experience. I used to finish the whole block of chocolate while intending only to eat a couple of pieces. I have given up sugar over a year ago, however, still get some cravings every now and then. I have never been addicted to drugs, so I can’t compare, but this seems pretty bad. My 11 year old son has also given up sugar at the same time and it was much easier for him – he only had 10 years as addict while I had 44. Bit of a difference. Is it worth it? Definitely! Both of us have not caught any colds or flus in that time, even though we’ve been around people sneezing and coughing. I no longer get those moments during the day when it’s hard to keep the eyes open and the only way to fix it is with a doughnut and coffee. These went gradually and subtly away over first few months. I have also lost about 7kg not intending to, and doing much less exercise then before. These benefits are similar with reports from others who have also given up sugar. Now, the most important question – what do I do about the sweetness? I use a bit of xylitol with my coffee. I also make ice-cream using xylitol – my son loves it. Xylitol is a tooth and gut-friendly sugar alcohol, but unfortunately, is bout 25 times more expensive than good old sucrose. Stevia, erythritol or D-mannitol can also be safely used. Even though xylitol tastes like sugar, and unlike stevia, has no after-taste, not everyone likes it. My mum, for example, is used to the sugar rush and consequent insulin response from conventional sugar. I guess, that’s one reason why it is so addictive. This entry was posted in diet, health and tagged addictive, Alzheimers, cholesterol, D-mannitol, diabetes, diet, erythritol, fructose, glucose, obesity, stevia, sucrose, sugar, Sweden, sweet, xylitol. Bookmark the permalink. 1 Response to Can we live without sugar?